There are a couple of people and events coming up that we want to plug. 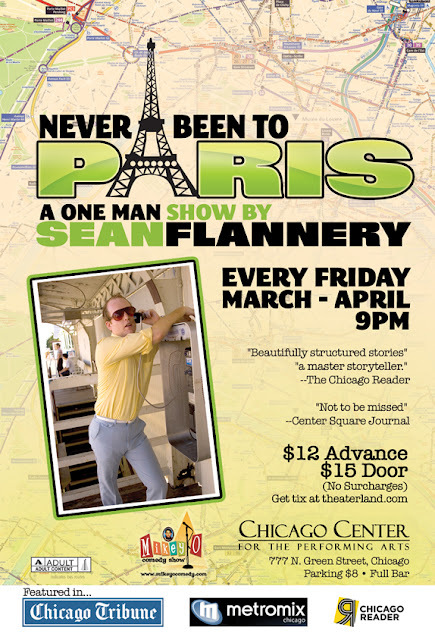 First you got Sean Flannery's one man show "NEVER BEEN TO PARIS" I keep hearing great things about this production, which had a super successful run at the Lincoln Lodge last fall. Now I know from first hand experience that Sean is a funny freaking guy but don't take my word for it, read this quote from www.gapersblock.com, "Flannery is both a warm and hilarious storyteller; the show spins what seem like tall tales but in fact are real-life experiences of the baffling number of ways Flannery has nearly killed himself (or friends, or siblings), as well as other just plain dumb things one does when drunk and lives to tell about." The show has gotten great reviews and will run though April 2011. Every Friday night @ 9 PM at the Chicago Center for Performing Arts, 777 N. Green St.; tickets are $12. The second show I want to plug is the "Pistol Party" twentieth monthly showcase which in Chicago stand up comedy terms is a hell of a run. That's happening tomorrow at Town Hall pub 3340 N Halsted at 9 PM. Drew Frees will be performing and besides being one of our favorite comedians in the scene, he is a genuinely nice guy so check it out, only $5! Lastly I want to send a huge shout out of support to the hardworking multi-talented Jamie Cambell. 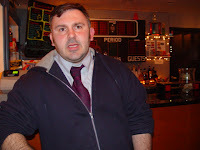 Jamie ran the 100 Proof Showcase and the Chaser Open mic at Comedy Sports Theater, which are now on it's spring Hiatus. Jamie you did great and deserve some credit for running one of the tightest nights of comedy in the city, everyone should look forward to September when it starts up again. But if you cant wait that long check then out his new show every friday at at Comedy Sportz. Here's the press release. 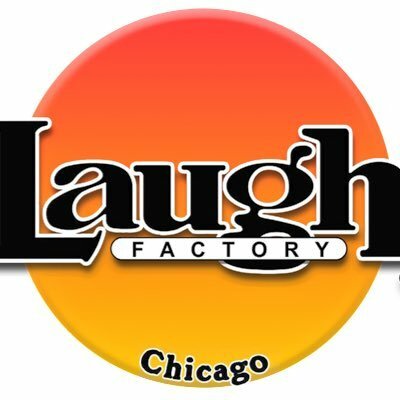 "100 Proof Comedy presents The Nightcap, on Fridays at midnight, starting THIS FRIDAY the 11th at ComedySportz Chicago! 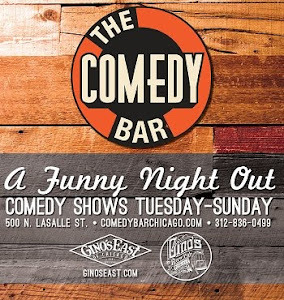 This is a very special, 7 week run, hosted by Jamie Campbell and Marty DeRosa! This week's lineup - Ryan Budds, Cameron Gillette, and Chris Schmidt! Just $5!"